My middle son had a number of health issues during our first two years in Singapore. Fortunately, these were nothing major, just the usual colds and upset stomachs and the odd ear infection, but it was enough for me to be warned. So when we moved into this house I wanted to make abolutely sure that I got his room “right”! His is a difficult room as it has three doors and has the standard built-in wardrobes along one of the walls. For my son, however, it worked very well as he can position his bed against the NW wall which is his “Health” direction. This was obviously important. We placed his desk in front of the window facing SW, his “Sheng Chi/Success” direction. Although he is sitting with his back to the door, which is not ideal, this is the only option available as there is not enough space on the SE wall opposite the bed. Furthermore, SE is my son’s “Total Loss” direction which he should avoid at all cost. 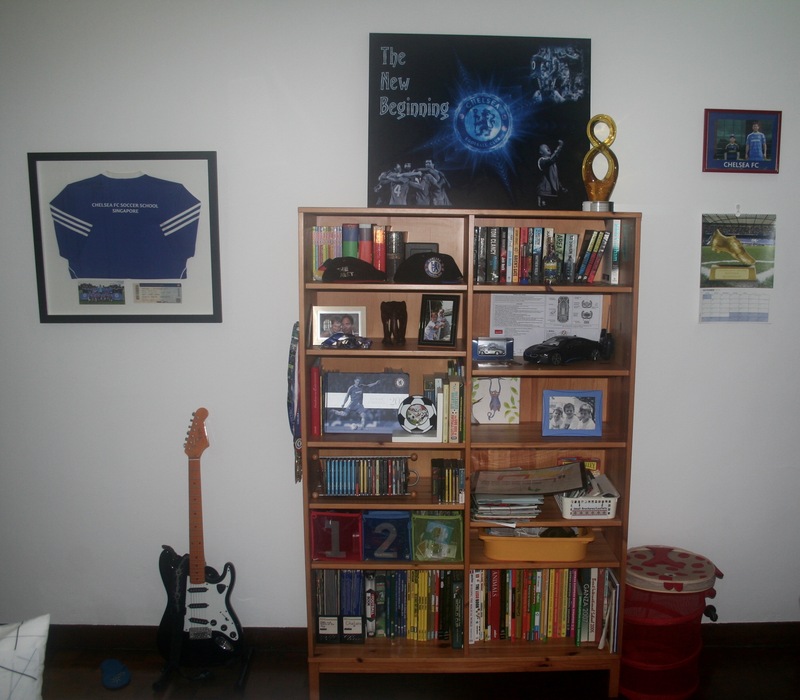 When we moved into the house, all walls were painted in a crisp, clean white and I felt my boys’ rooms needed a bit of colour. One of the basic Feng Shui bedroom rules is that your headboard should never be placed against a wall sharing the bathroom as the excessive water energy can lead to sleepless nights and illness. There is indeed a bathroom behind the wall where we placed my son’s bed but since there is no other option in this room I used the recommended Feng Shui cure and painted that wall red. This represents fire energy which will counter the water energy behind. We had the predominantly red curtains from our previous apartment and since a big part of the room falls into the SW sector of the house, red is a good colour here. Fire element supports the earth element of the sector. 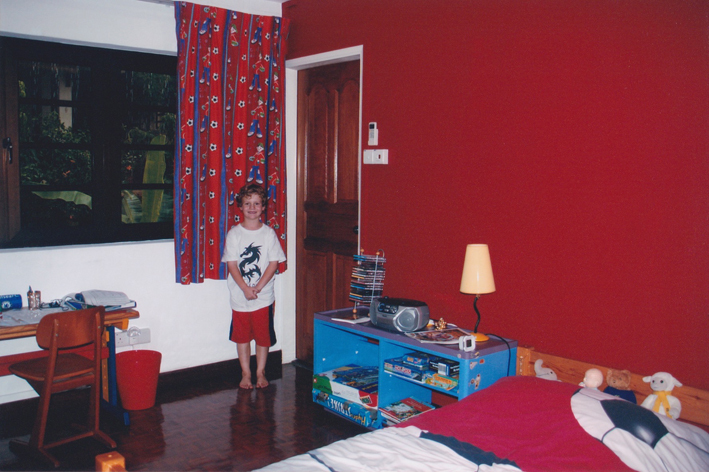 Luckily, my son likes the colour red and his room came together nicely. He loved his room in the “new” house and everything was good. He was (and still is) doing well at school and never got sick during the first few years. After about three years, my other two boys swopped rooms and we also moved their beds around. My son was excited to get the cool Flexa bed from his big brother. I was a bit concerned because we had to change the direction of the bed due to the ceiling fan in the middle of the room. 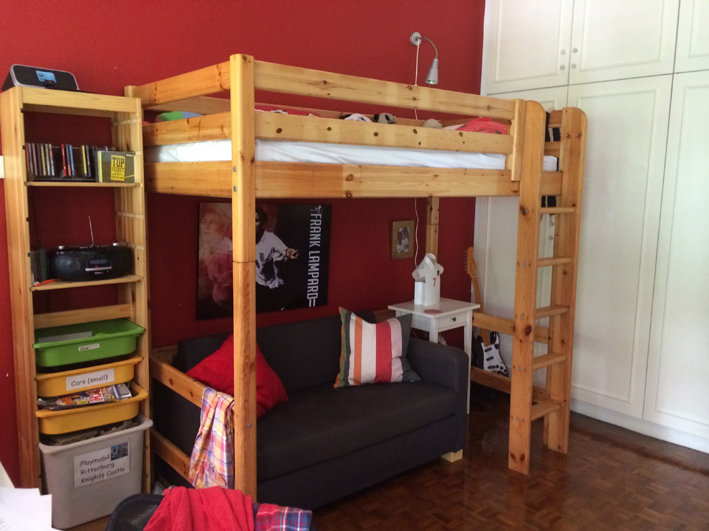 My son was now sleeping towards NE, his “Personal Growth” direction, which is still great, but we could no longer place the bed against a solid wall (another basic Feng Shui rule!). We did not want to place the bed right against the wardrobe, so I kept the distance here to a minimum. The room now felt more spacious and the additional sofa gave him a lovely space to chill. The new set up looked great and my son was very happy. During that time, however, I could feel that my son was beginning to lose his grounding a bit (a common Feng Shui concern when it comes to loft beds). He also started to pick up bugs and viruses again and the following year he had quite a nasty sailing accident which resulted in 13 stitches on his ankle! My son grew rather fast during these early teenage years and soon he outgrew the Flexa bed which I had originally thought we would have forever. I decided to buy him a new and bigger bed. I really couldn’t wait to have him sleep in his “Health” direction again! At the same time we also upgraded his desk. We chose white furniture to increase the metal element in the room which in turn subdues the illness energy brought by the flying stars chart of the house. My son is now 15 years old and I felt the whole room needed a make-over. 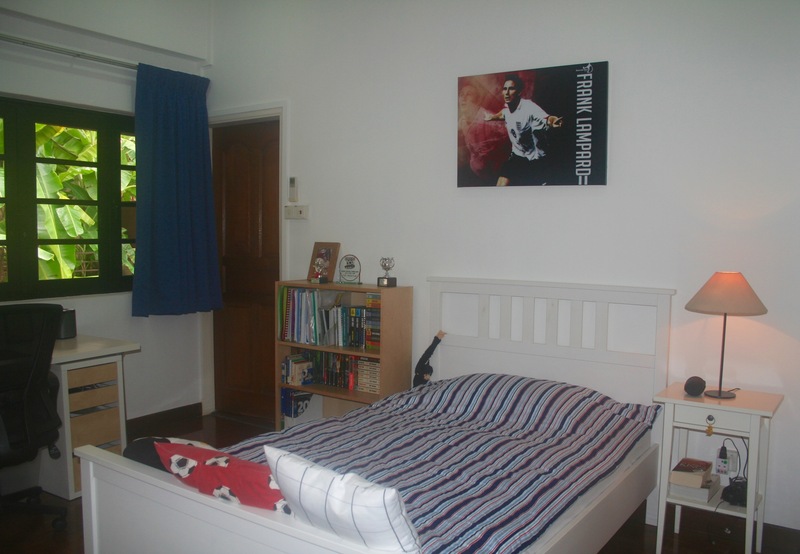 I decided to paint the red wall white again and hung the canvas print of his favourite football player with the fiery background above the headboard. Since there are no water pipes within that wall I am confident that this will be sufficient fire energy to subdue the bathroom behind. Should that not be the case I will add another red picture. I also had new curtains made. This time I chose the colour blue which will enhance the flying stars combination in his room (while the previous red accessories were beneficial for its compass location). Light brown bedside rugs strengthen the earth energy of the compass sector and give grounding energy while at the same time covering some of the unwanted wood energy from the parquet flooring. The red laundry basket is now better positioned in the South corner of the room as this belongs to the fire element. The blue and black Chelsea pictures continue to stay in the East and SE sectors of the room since those benefit from the colours of the water element.